Two people from opposite worlds, one unforgettable kiss. You can’t judge a carny by its cover. At a town fair on the coast of Oregon, handsome Native American carny, Vincent Youngblood, bestows an unforgettable kiss on shy, awkward teenager, Charlotte Davenport. Then disappears without another word, leaving her baffled and enamored. Ten years later, Charlotte is still living in the small fishing town of Astoria, while being trained to–reluctantly–take over for her philandering hotelier father when he retires. After all, who else will do it? Her two perfect sisters are busy being married to their flawless husbands and having cookie cutter children, while Charlotte remains single, childless, and every bit as mousy as she was a decade ago. As Charlotte struggles to climb out from underneath her judgmental parents thumb, the carnival rolls back into town, and Charlotte finds herself face to face with Vin again. He’s back to run his father’s carnival, walking away from a promising career in medicine he started in Chicago. Will her biased and judgmental family accept her relationship with a man who is not only a Native American, but works as a carny for a living? And what unsavory secrets bind the well-educated and seemingly superlative Vin to that ramshackle carnival? After all, you can’t judge a carny by its cover. About the author: Brooke Moss lives in beautiful eastern Washington state, with her nerdy husband, four dirty-faced children, and one dim-witted dog. When she’s not changing diapers and spinning tales, Brooke often changes the color of her hair, fancies herself a cheese aficionado, and as the mother of a child on the Autism Spectrum, enthusiastically supports autism awareness. She loves to write stories that are equal parts hilarious and heart-wrenching, and enjoys finding the love story in every ordinary couple’s past. Now…if she could just climb out from under that pile of dirty laundry. Find Brooke elsewhere on the web at www.brookemoss.com and on Twitter at @BrookeMoss4. 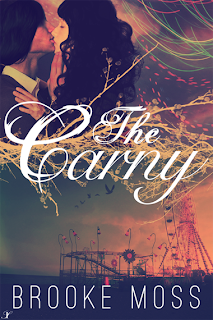 The Carny is like a modern day telling of Jane Austen's Persuasion. When we first meet Charlotte at a carnival one summer evening, she is in the midst of being humiliated by her supposed mean girl friend while on line for a ride. Charlotte's humiliation? Had she been kissed or not? Trying to hedge the question, she is aided by the carny collecting tickets. This good looking, sweet young guy saves Charlotte from being the talk of her high school by giving her what she didn't want to admit she's never had--her first kiss. That kiss makes quite an impression on her and for ten years afterwards, she carries the feeling from that magical moment with her. When she moves back home at twenty-eight to be groomed by her father to take over his hotel, Charlotte still finds herself attending the annual town Crab Festival in hopes of running into Vin. This year she could really use something good in her life, especially after being dumped at the altar by her cheating ex-boyfriend, Lance. When her wish comes true and she hears Vin say her name out loud, Charlotte becomes her teen self again momentarily. Could her desire to rekindle that one night spark become something lasting? Brooke Moss has written a contemporary romance with wit, honesty, unique characters, and added lots of spirit and a heaping of heart in The Carny. Charlotte is the equivalent of the black sheep of her family--she's the total opposite of her skinny, blond mother and older sisters. Unlike her siblings, she is not married, childless, and moved back home when her mother threatened to jump off a bridge. To say the Davenport family has problems is putting it mildly, and Charlotte has to let go of her childish hang-ups and learn to trust if she is to have a chance with Vin. 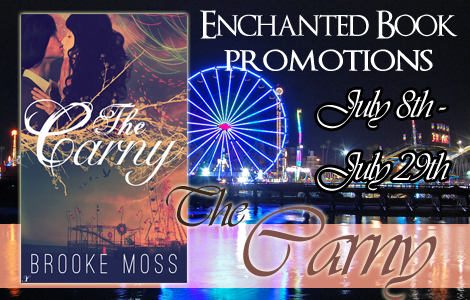 Her family doesn't want want her dating a Native American Indian, especially one who's a carny. But love does conquer all--sometimes it just takes clearing a bunch of hurdles. There were a few occasions when Charlotte told us too much about her family life and I would have preferred a scene instead. I liked her even when I wanted to scream at her. She was real and, like a certain Anne Elliot, had to stand up for herself and her heart. Vin was very worthy of my swooning over him. He accepts Charlotte for who she is, no matter what. Brooke Moss may not write the cookie cutter stories we find so easily available on the market and that's fine with this reader. For outstanding storytelling featuring unique characters like I found in The Carny, I'll stick with this author to entertain me while pulling on my heartstrings. Another book to take on vacation! Rating: **** 4 Very entertaining. Cover comment: There is something so surreal and dreamy about this cover design and that's why I like it. Colorful, has movement, and I like the couple in the corner. Book source: I received an ebook copy of this novel for my honest review during a book tour. This one looks awesome :) An interesting take, that's for sure! !